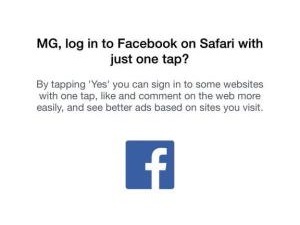 Facebook Testing One-Click Login via Safari? Facebook is testing a new tool that allows users of its iOS application to log into the social network via that operating system’s Safari browser with one click. Facebook confirmed the test to Josh Constine of TechCrunch after former TechCrunch writer MG Siegler shared the first screenshot below with Constine. The tool allows users to log into Facebook on Safari with one click, rather than having to enter their login credentials (shown in the second screenshot below), making it easier for users to access Facebook features such as events that are shared via email, as well as to share or comment on posts. Constine also pointed out that enabling users to easily access Facebook via Safari also gives the social network access to information on which sites those users browse to. Readers: What are your thoughts on the tool Facebook is testing?